Childhood kidney tumors are diseases in which malignant (cancer) cells form in the tissues of the kidney. There are two kidneys, one on each side of the backbone, above the waist. Tiny tubules in the kidneys filter and clean the blood. They take out waste products and make urine. The urine passes from each kidney through a long tube called a ureter into the bladder. The bladder holds the urine until it passes through the urethra and leaves the body. There are many types of childhood kidney tumors. In Wilms tumor, one or more tumors may be found in one or both kidneys. Wilms tumor may spread to the lungs, liver, bone, brain, or nearby lymph nodes. 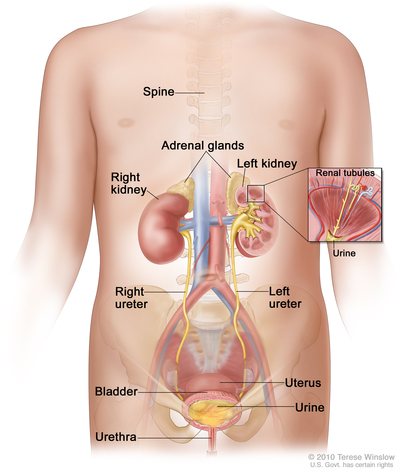 In children and adolescents younger than 15 years old, most kidney cancers are Wilms tumors. Renal cell cancer is rare in children and adolescents younger than 15 years old. It is much more common in adolescents between 15 and 19 years old. Children and adolescents are more likely to be diagnosed with a large renal cell tumor or cancer that has spread. Renal cell cancers may spread to the lungs, liver, or lymph nodes. Renal cell cancer may also be called renal cell carcinoma. Rhabdoid tumor of the kidney is a type of kidney cancer that occurs mostly in infants and young children. It is often advanced at the time of diagnosis. Rhabdoid tumor of the kidney grows and spreads quickly, often to the lungs or brain. Children younger than one year old have an ultrasound of the abdomen every two to three months and an ultrasound of the head every month. Children one to four years old have an ultrasound of the abdomen and an MRI of the brain and spine every three months. Clear cell sarcoma of the kidney is a type of kidney tumor that may spread to the lung, bone, brain, or soft tissue. When it recurs (comes back) after treatment, it often recurs in the brain or lung. Congenital mesoblastic nephroma is a tumor of the kidney that is often diagnosed during the first year of life. It can usually be cured. Ewing sarcoma (previously called neuroepithelial tumor) of the kidney is rare and usually occurs in young adults. These tumors grow and spread to other parts of the body quickly. Primary renal myoepithelial carcinoma is a rare type of cancer that usually affects soft tissues, but sometimes forms in the internal organs (such as the kidney). This type of cancer grows and spreads quickly. Cystic partially differentiated nephroblastoma is a very rare type of Wilms tumor made up of cysts. Multilocular cystic nephromas are benign tumors made up of cysts and are most common in infants, young children, and adult women. These tumors can occur in one or both kidneys. Children with this type of tumor also may have pleuropulmonary blastoma, so imaging tests that check the lungs for cysts or solid tumors are done. Since multilocular cystic nephroma may be an inherited condition, genetic counseling and genetic testing may be considered. See the PDQ summary about Unusual Cancers of Childhood Treatment for more information about pleuropulmonary blastoma. Primary renal synovial sarcoma is a cyst-like tumor of the kidney and is most common in young adults. These tumors grow and spread quickly. Anaplastic sarcoma of the kidney is a rare tumor that is most common in children or adolescents younger than 15 years of age. Anaplastic sarcoma of the kidney often spreads to the lungs, liver, or bones. Imaging tests that check the lungs for cysts or solid tumors may be done. Since anaplastic sarcoma may be an inherited condition, genetic counseling and genetic testing may be considered. Nephroblastomatosis is not cancer but may become Wilms tumor. Sometimes, after the kidneys form in the fetus, abnormal groups of kidney cells remain in one or both kidneys. In nephroblastomatosis (diffuse hyperplastic perilobar nephroblastomatosis), these abnormal groups of cells may grow in many places inside the kidney or make a thick layer around the kidney. When these groups of abnormal cells are found in a kidney after it was removed for Wilms tumor, the child has an increased risk of Wilms tumor in the other kidney. Frequent follow-up testing is important at least every 3 months, for at least 7 years after the child is treated. Having certain genetic syndromes or other conditions can increase the risk of Wilms tumor. Anything that increases the risk of getting a disease is called a risk factor. Having a risk factor does not mean that you will get cancer; not having risk factors doesn't mean that you will not get cancer. Talk to your child's doctor if you think your child may be at risk. WAGR syndrome (Wilms tumor, aniridia, abnormal genitourinary system, and mental retardation). Denys-Drash syndrome (abnormal genitourinary system). Frasier syndrome (abnormal genitourinary system). Beckwith-Wiedemann syndrome (abnormally large growth of one side of the body or a body part, large tongue, umbilical hernia at birth, and abnormal genitourinary system). A family history of Wilms tumor. Aniridia (the iris, the colored part of the eye, is missing). Isolated hemihyperplasia (abnormally large growth of one side of the body or a body part). Urinary tract problems such as cryptorchidism or hypospadias. Tests are used to screen for Wilms tumor. Screening tests are done in children with an increased risk of Wilms tumor. These tests may help find cancer early and decrease the chance of dying from cancer. In general, children with an increased risk of Wilms tumor should be screened for Wilms tumor every three months until they are at least 8 years old. An ultrasound test of the abdomen is usually used for screening. Small Wilms tumors may be found and removed before symptoms occur. Children with Beckwith-Wiedemann syndrome or hemihyperplasia are also screened for liver and adrenal tumors that are linked to these genetic syndromes. A test to check the alpha-fetoprotein (AFP) level in the blood and an ultrasound of the abdomen are done until the child is 4 years old. An ultrasound of the kidneys is done between the ages of 4 and 7 years old. A physical exam by a specialist (geneticist or pediatric oncologist) is done two times each year. In children with certain gene changes, a different schedule for ultrasound of the abdomen may be used. Children with aniridia and a certain gene change are screened for Wilms tumor every three months until they are 8 years old. An ultrasound test of the abdomen is used for screening. Some children develop Wilms tumor in both kidneys. These often appear when Wilms tumor is first diagnosed, but Wilms tumor may also occur in the second kidney after the child is successfully treated for Wilms tumor in one kidney. Children with an increased risk of a second Wilms tumor in the other kidney should be screened for Wilms tumor every three months for up to eight years. An ultrasound test of the abdomen may be used for screening. Having certain conditions may increase the risk of renal cell cancer. Von Hippel-Lindau disease (an inherited condition that causes abnormal growth of blood vessels). Children with Von Hippel-Lindau disease should be checked yearly for renal cell cancer with an ultrasound of the abdomen or an MRI (magnetic resonance imaging) beginning at age 8 to 11 years. Tuberous sclerosis (an inherited disease marked by noncancerous fatty cysts in the kidney). Familial renal cell cancer (an inherited condition that occurs when certain changes in the genes that cause kidney cancer are passed down from the parent to the child). Renal medullary cancer (a rare kidney cancer that grows and spreads quickly). Hereditary leiomyomatosis (an inherited disorder that increases the risk of having cancer of the kidney, skin, and uterus). Prior chemotherapy or radiation therapy for a childhood cancer, such as neuroblastoma, soft tissue sarcoma, leukemia, or Wilms tumor may also increase the risk of renal cell cancer. See the Second Cancers section in the PDQ summary about Late Effects of Treatment for Childhood Cancer for more information. Treatment for Wilms tumor and other childhood kidney tumors may include genetic counseling. A genetic syndrome or condition that increases the risk of Wilms tumor. An inherited condition that increases the risk of renal cell cancer. Rhabdoid tumor of the kidney. Signs of Wilms tumor and other childhood kidney tumors include a lump in the abdomen and blood in the urine. A lump, swelling, or pain in the abdomen. High blood pressure (headache, feeling very tired, chest pain, or trouble seeing or breathing). Hypercalcemia (loss of appetite, nausea and vomiting, weakness, or feeling very tired). Tests that examine the kidney and the blood are used to detect (find) and diagnose Wilms tumor and other childhood kidney tumors. Blood chemistry studies: A procedure in which a blood sample is checked to measure the amounts of certain substances released into the blood by organs and tissues in the body. An unusual (higher or lower than normal) amount of a substance can be a sign of disease. This test is done to check how well the liver and kidneys are working. Renal function test: A procedure in which blood or urine samples are checked to measure the amounts of certain substances released into the blood or urine by the kidneys. A higher or lower than normal amount of a substance can be a sign that the kidneys are not working as they should. Ultrasound exam: A procedure in which high-energy sound waves (ultrasound) are bounced off internal tissues or organs and make echoes. The echoes form a picture of body tissues called a sonogram. An ultrasound of the abdomen is done to diagnose a kidney tumor. CT scan (CAT scan): A procedure that makes a series of detailed pictures of areas inside the body, such as the chest, abdomen, and pelvis, taken from different angles. The pictures are made by a computer linked to an x-ray machine. A dye is injected into a vein or swallowed to help the organs or tissues show up more clearly. This procedure is also called computed tomography, computerized tomography, or computerized axial tomography. MRI (magnetic resonance imaging) with gadolinium: A procedure that uses a magnet, radio waves, and a computer to make a series of detailed pictures of areas inside the body, such as the abdomen. A substance called gadolinium is injected into a vein. The gadolinium collects around the cancer cells so they show up brighter in the picture. This procedure is also called nuclear magnetic resonance imaging (NMRI). X-ray: An x-ray is a type of energy beam that can go through the body and onto film, making a picture of areas inside the body, such as the chest and abdomen. Whether cancer is in one or both kidneys. Whether imaging tests clearly show the cancer. Whether the patient is in a clinical trial. A biopsy may be done before any treatment is given, after chemotherapy to shrink the tumor, or after surgery to remove the tumor. How different the tumor cells are from normal kidney cells when looked at under a microscope. Whether there are certain changes in chromosomes or genes. Whether the cancer has spread to the lymph nodes.